If you’re a beginner and don’t have a good idea on how rank calculations are carried out then, this article might help you. This article also includes details about the advanced version of such calculations once you enter into the next stage of business – intermediate, and above. So, how exactly does a rank calculation work and what exactly rank meant for? The Network marketing business model is strategically one of the best marketing methods to bring up light into the business. If you’re a beginner, let’s see what exactly the rank calculations are and how is it done? Rank calculations – the criterion to scale business users! These conditions can be set as criteria’s for rank calculations. Direct distributor network based conditions i.e., distributors who are directly sponsored are taken into consideration. 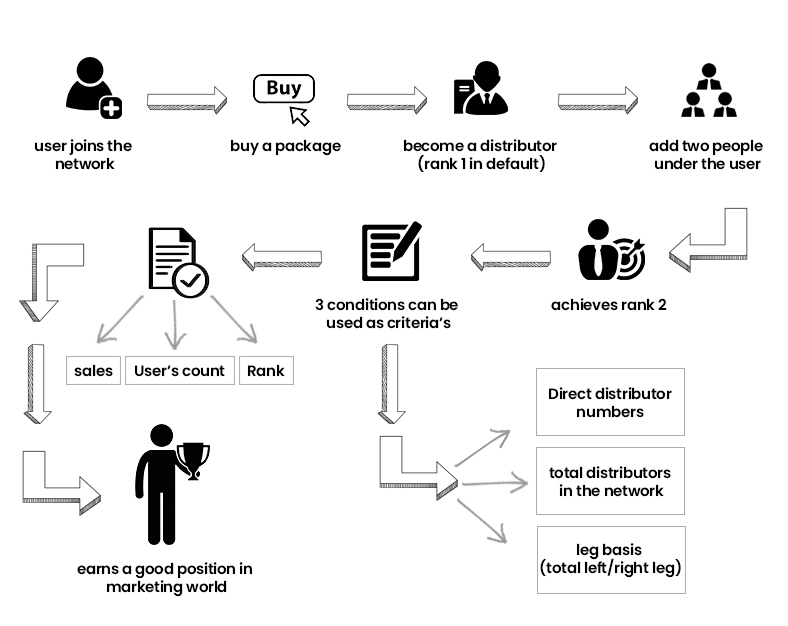 Total distributors in the network – Here the complete distributor under the sponsor is taken into consideration alongside i.e., both direct and indirect member line-up. Calculate based on the leg – Either right or left leg members are considered in this criterion. These all criteria’s are well used in other Marketing plans too like a unilevel plan, matrix plan, etc. The above conditions can be set off as per the number of users, user sales, or the ranks. For example, a user achieves rank 4 once the corresponding direct sponsored member and recruiting 2 members with rank 3 directly. This is a perfect condition that can be set in your business. That’s it about the conditions. When does the rank calculation carried out? Now that we understood how the rank calculations are done based on various conditions, it’s time to know when these calculations are carried out. Basically, the ranks in a network marketing are carried out using either of the below time periods. Daily, weekly, monthly calculations are familiar to you, what about the others? Period calculations are carried out in a custom manner like for three months, six months – typical calculations. The final one will be instant calculation and it’s done once the conditions are satisfied. Let’s say this with an example, you need to recruit 100 members and you recruited 98 to a particular date and off in a sudden you recruited two more members and the conditions are now satisfied. Admin of the business network can instantly advance the user’s rank. So, that’s about rank calculation, and now, the next thing that might come into your mind will be – Can we do it manually? If so how far is it reliable? The solutions stick to one thing, the manual calculations are long gone, and everything is now automated. Many tools are available for binary calculations like binary calculator, rank calculator, etc. But is that enough for your marketing business? The answer is no, it’s always better to go for a complete package, at least a basic one at the beginning period once your business expands to a fair number. Go for a basic version within your budget limits, and get an advanced model as the business grows further. Epixel is one among the software providers in the network marketing business with advance rank calculations, and other Features. The advance rank processing engine is available in the system, and instant rank advancement using “rank vesting” (admin has the power to level up ranks to higher side directly without even meeting the desired conditions). The system also provides the user with an extra option to see how far the user has to proceed further to achieve the rank advancement. So, basically, have a good MLM system to advance through in business and choose the system with good research and comparison.